JM Running Group will be taking part in all the following runs – come and join us. It is a great opportunity to run with friends, have some fun and raise money for a good cause at the same time. The second featured race JM running group will be attending is the New Year’s Eve 10 Miler. A Perfect challenge to end the year. And maybe finish with a cheeky mulled wine in the local pub!!! JM Running Group and its members will be entering the above races and many more this year and next year. So if you see an event you fancy entering, let us know as we may be able to team you up with a training partner of similar ability, and we will definitely be able to help you with your pre-race training with training plans and advice. But most valuable of all you will be able to meet up with our member and see a friendly face on race day to take on the challenge and share in your triumph. We look forward to seeing you at a race soon! We have had a tremendous response to our new Outdoor Running Group since its launch on 17th Oct 17. With over a 100 local runners joining us over the first few weeks. With runners from the age of 13 upwards. 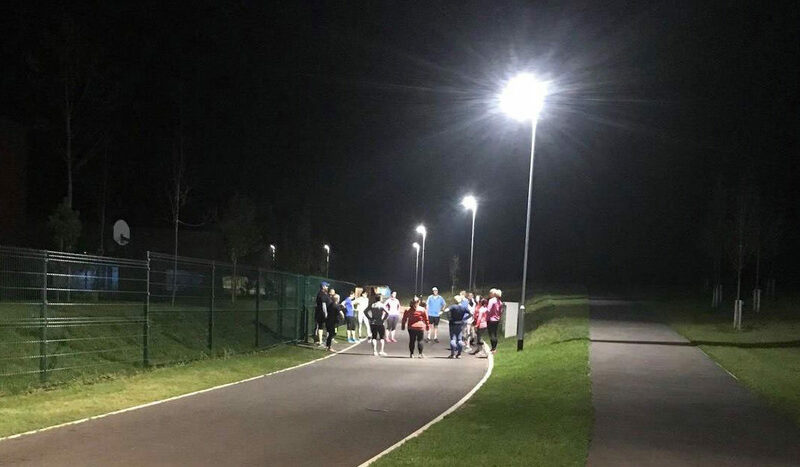 Ysgol Bro Teifi, Llandysul provides the perfect venue to coach running with its flat floodlit running circuit and safe traffic free environment. Over the first few sessions we have introduced specific drills to help improve running technique. The sessions follow a structured formula with a gentle warm-up (and chat as we jog around the circuit). Followed by a more specific activation drills to ensure everyone is at their best to start the session. We then introduce key technique drills which are reinforced throughout the main session. With drills such a squashed tomatoes, bum claps and hang tall to name a few. Each week we focus on a different training stimulus to provide group members with lots of variety to help improve and enjoy their running from easy base runs, to stronger tempo runs and everything in between. However, our main focus is improving everyone as a runner (better technique, improved efficiency = better running). So our sessions cater and are adjusted for every ability and fitness level and are always underpinned by technique and a high level of coaching. So if you are local and want to improve your running, come and join our friendly group where we will provide lots of support, advice and motivation to keep you smiling when your running.